Boys begin the 100-meter run around Morgan Bowl. Hudson – On a seasonably cool Nov. 4, about 150 supporters of the C.A. Farley Elementary School physical education department and the Farley Home & School Association ran in the seventh annual Farley Fox Trot at Morgan Bowl in Hudson. Participants got a t-shirt depicting the school’s fox mascot drawn by third-grader Rudy Wallingford, whose design won an art contest. 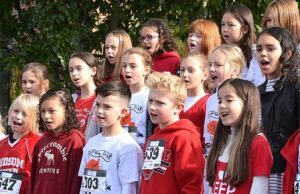 Before runners took their marks on the track, the fourth-grade chorus sang the national anthem under the direction of choral and music teacher Christina Straus. 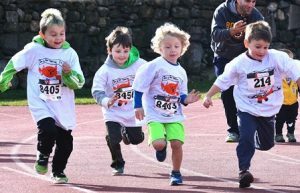 Girls and boys in preschool through fourth grade could choose to run a 100-, 200-, 400- or 800-meter race. Volunteering to help with registration and serving water during the event were Hudson High School (HHS) girls’ cross-country teammates. HHS sports announcer Don Quinn kept spectators informed while cheering for the runners. First to finish the 100-meter run were kindergarteners Kyla Duplease and Cameron Edison. First-graders Tatiana Chaplain and Tyler Chaves were the first to complete the 200-meter run. 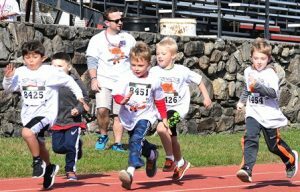 The 400-meter run was finished first by third-graders Nicholas Chaplain and Addy Peckham. 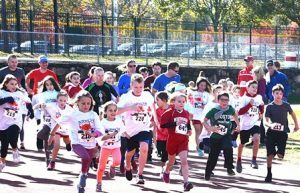 Fourth-graders Lydia Azar and Anthony Moura finished first in the 800-meter run. 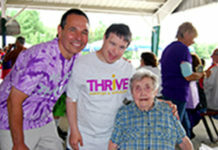 The event concluded with a one-mile race in which runners of any age could participate. Adults including parents and teachers joined the students. Fourth-grader Cole DiPerso finished first overall in 6:38. Everyone was awarded a medal by Farley administrative assistants Susan DiCenza and Heather Pacquette. 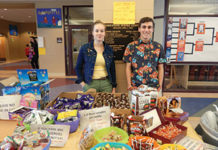 Proceeds from the fundraiser go toward purchases of equipment for recess and physical education. Boys running 200 meters pass physical education teacher Brian Quinn. Girls run 800 meters around Morgan Bowl. Runners of all ages begin the one-mile course.